Make your meals work for you! Power bowls are the newest nutritional trend--and for good reason. These versatile dishes are all about macronutrients and are packed with whole, nutrient-dense foods that are filling, satisfying, and completely free of empty calories and processed and refined foods. Best of all, the wholesome ingredients can be mixed, matched, and combined to create delicious meals that provide specific health benefits. 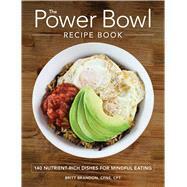 With detailed nutrition information and a gorgeous photo for every recipe, The Power Bowl Recipe Book is the first step on the road to ultimate health!